As I have walked the streets of Old Taura, I have passed these noren—and next to them the glass display case of dusty plastic food (bowl of ramen, some stir-fried rice, plate of stereotypical gyoza)—and wondered if I should go in, but something always held me back. Except for the noren, I never would have guessed the place was open: the lights aren’t bright inside and I never see movement behind the frosted glass doors. But Sunday afternoon circumstances were ripe for a visit. We were slightly hungover after a sake meetup on Saturday night (report to come). We were headed to the Taura Bairin to check on the plum blossoms. The curtains were hanging outside the shop, and I felt a growing need to seize the day in the face of our limited time left in Japan, so we slid the door open and found the ramen shop that time forgot. The tabletops and counters are clean, but everything in the shop seems covered with a layer of nicotine and time. On the tables, the bottles of vinegar, chili oil, soy sauce, and togarashi (hot pepper) are coated with their own contents, handled and handled by the many hands of Tauran customers. The bemused proprietor (he would giggle when I spoke Japanese) served us cold water from a water dispensing machine that must be 40 years old. 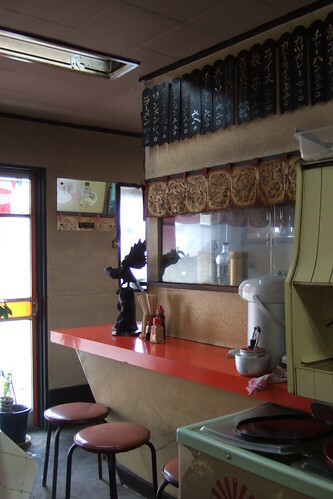 He took our order—miso ramen with chāshū (slices of roasted pork), a plate of gyoza, and a small bowl of rice—and disappeared back into the kitchen. We were left to contemplate the room. The floors are cracked concrete suggesting the space could once have been a garage. 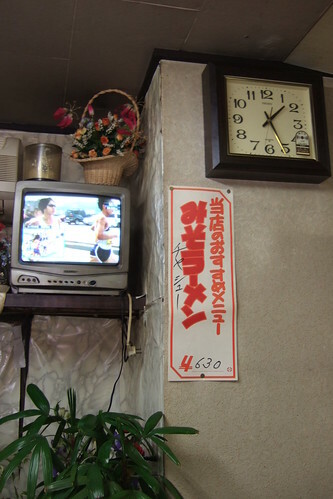 The ramen shop was trying to tell us it was 1970, but a 2008 calendar hung on the wall, and the TV was showing coverage of the recent Tokyo Marathon. Every detail of this kimokawa (strange but cute) place made me stupidly happy. The owner/cook took a very long time in the kitchen, but there were reassuring sounds of water boiling, heavy chopping on a wooden board, clinking of pots. He finally emerged with a plate of misshapen, but clearly handmade gyoza, and a gorgeous bowl of ramen topped with in-house roasted pork belly. We fell to: the ramen broth was unctuous with pork bone marrow (a sign of well-made broth) and instead of the standard garnish of paper-thin slices of pork, there were thick chunks of glistening, fatty, delicious pork belly. My gyoza lay flat on the plate, instead of standing up with perfect perky pleats in the dough wrappers, but they were stuffed with a fresh tasting, garlicky, bright green cabbage filling. We moaned over the food. It was so much better than two other ramen places we frequent that we were kicking ourselves that we had not come earlier. As I paid the bill, the owner giggled some more as I spoke to him, and told me his name (either Hourai or Hourei, need to recheck this—if I can get him to stop sniggering with delight that a gaijin has come to his shop). 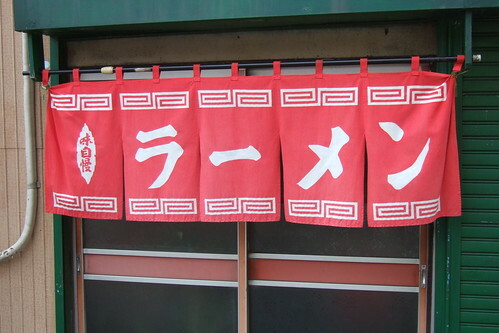 On one of the signs, I noticed he also offers “Sapporo Ramen.” I’m not sure what if this means what I think it means (butter and miso broth), but I’ll be back to find out. Hangovers tamed, we continued on to the plum blossoms. As we walked up to the orchard, we discussed, in that we-totally-get-it way of our retro relationship, that this shop is exactly what we need to defend against the encroaching forces of International Fast Food and slick commercialism. Not much in Taura is slick or commercial anyway, but what more delicious pleasure is there to not know what one will find behind the doors of a new shop? Will the food be good? What do they serve and how will it be different than other places we have been? The only defense against the predictable and prepackaged is to come back and eat the food.